2006 and 2007 brought change and challenge to the Peace Council. A substantial decline in contributions beginning in the previous year meant that our small staff of three persons worked as volunteers after July, 2006. I agreed to continue as interim executive director for a year after my retirement in November, 2006. In February, 2007 we closed our office in Madison to reduce expenses. Since then I have been working from an office in my home as a volunteer. The last five years' financial reports show clearly how much we lost. Unfortunately this meant that the Peace Council's plan to meet in Paris with European Muslim opinion leaders had to be cancelled because of insufficient funds. Nevertheless 2007 began auspiciously with an inspiring and well-attended benefit soiree held in Madison on a snowy evening in February. It was an exhilarating celebration and a financial success. In part because of this support the Councilors were able get together in late 2007 for a planning meeting and to participate in the groundbreaking ceremonies for the Peace Bell Park near the edge of the Demilitarized Zone between North and South Korea. 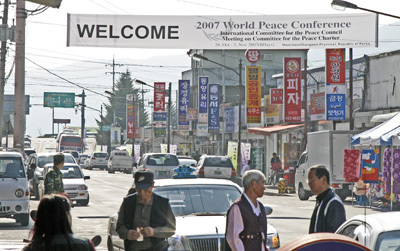 The county of Hwacheon (South Korea) contributed the costs of the Peace Councilors' travel and accommodations. 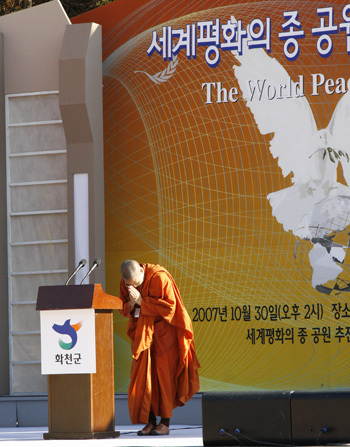 This Peace Council meeting -- the tenth since the Council's beginning in 1995 -- took place in Korea from October 29 to November 2, 2007. Click here for an account of the meeting. The meeting was part of our decade-long involvement in peacemaking on the Korean peninsula. Since 1997 the Peace Council has provided humanitarian aid to hospitals in North Korea, facilitated contacts between North Korean, South Korean, and U.S. government officials, and co-sponsored the annual Korea Peace Forum in Seoul. At the Peace Bell Park the Councilors helped inaugurate a future center for "peace tourism," education, and reflection in an area that saw some of the deadliest and most savage fighting of the Korean War. Half a century later the DMZ remains the world's most intensively-militarized political boundary. During the week the Councilors also met with the heads of the DMZ Forum, the Korea Otter Research Center, and the International Crane Foundation to discuss plans to create an international wildlife refuge in the Demilitarized Zone. The DMZ, four kilometers wide and extending 240 kilometers across the Korean Peninsula, has been essentially untouched by humans for more than fifty years, so it has become a unique sanctuary for threatened species. The DMZ Forum brings together individuals and non-governmental organizations to promote the area's permanent status as a transboundary peace park and wildlife refuge. In Korea the Councilors discussed the Peace Council's progress and future plans. The decline in contributions, the closing of the office, and my retirement as executive director meant that this meeting was especially significant. The Peace Councilors are determined to continue working together. They and the trustees agreed to appoint a transitional committee (Peace Councilor Hizkias Assefa and trustees Joseph Elder and Sr. Marcelline Koch) to manage the organization and conduct a search for a new executive director. Trustees John Udelhofen (treasurer) and Steve Minnema agreed to help administer the Madison office, which now has a new postal address: c/o Joseph Elder, 1112 Grant Street, Madison, WI 53711, USA. I retire now with mixed emotions: It is hard to say goodbye to work that has been so fulfilling and it is hard to leave the extraordinary group of friends that the Peace Councilors and trustees have become over the years. I hope to continue my support for the Peace Council by writing about its work and the lessons I have learned along the way. As one of the Peace Councilors said to me recently, "It's been an amazing ride..." The Peace Council has an impressive list of accomplishments for such a young organization, and clearly that is due to the extraordinary wisdom, experience, and commitment of the Councilors. It is easy to understand why they are determined to continue. None of this would have happened without generous contributions and encouragement over the years by many persons and organizations. Many thanks to all! Click here to view 2002-2007 financial statements. Peace Councilors Samdech Preah Maha Ghosananda and H.E. Dr. L. M. Singhvi died in 2007. Members of the Peace Council from the beginning, both were widely respected for their many contributions to peacemaking.